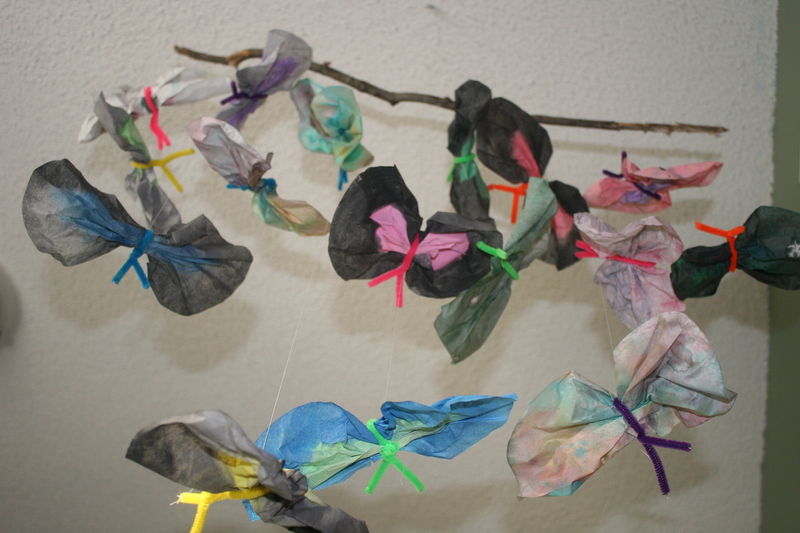 A coffee filter butterfly mobile semed to be a popular project with my children. They spent quite a bit of time using watercolor paints to paint their coffee filters. The next day, they used pipe cleaners to complete the butterflies. We needed a stick to hold all of them. The one we used was part of a stick that has seen a lot of play throughout the winter. It was used to dig snow, claim snow mountains with a flag, shoot imaginary arrows at armies of enemy invaders, and cast magical spells which resulted in white ground covering. The kids were happy to see this stick of magical properties see a new life in their project. We may just use it to make different mobiles throughout the year. March’s Families, Create! challenge was filled with awesome animal-themed posts. From Mo Willems to monkey finger puppets, our writers and crafters kept busy getting creative with the little animals in their lives. Visit Code Name: Mama and Living Peacefully with Children to find out how you can participate in the next Families, Create! Carnival. Our April theme is “Fantasy” – childhood is a fascinating time, filled with magic around every corner. What can your family imagine and create? Most of us have monkeys running around our house at times. Or lions. Or elephants. Make your child’s creative animal play even better with stuffed animal tails! Dionna at Code Name: Mama shares an easy tutorial. Mandy at Living Peacefully with Children knitted some simple Nugget Bunnies for her children’s Ostara baskets while practicing a new technique. Lauren at Hobo Mama has a fun and easy game to make to stimulate your preschooler’s memory. Using her children’s artwork as inspiration, Mandy at Living Peacefully with Children woodburned wooden eggs for them to color in honor of Spring. Love this idea! I actually have a bunch of coffee filters left over that don’t work with my new coffee pot! I’m going to share this with my girls and will update you. I also subscribed. Love your blog! Oh I really like the idea of using a stick to make the mobile. What did you use to hold them onto the stick? So pretty!! How fun! I love crafts like this one that are simple enough a toddler can do it and actually have the end result be recognizable as the animal (or bug in this case) it’s supposed to be! So fun! I’m totally going to steal some coffee filters next time I’m at my parents house! Max would love to do this! And I totally understand that stick getting a lot of use; the perfect stick is a valuable find! We might just have to go and borrow some coffee filters from magas and papas house. My daughter would especially think this is fun! Love it! I just love that the stick has been put to so many uses. It truly is magical!